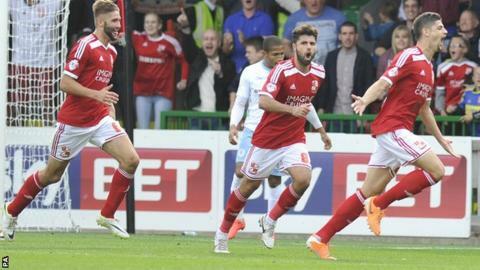 Raphael Rossi-Branco's second-half header gave Swindon a share of the points against Coventry. The Sky Blues took the lead with their first shot of the game as Josh McQuoid forced his way past Wes Foderingham and slotted into an empty net. Goalkeeper Foderingham did well to prevent the visitors doubling their advantage after the interval when he saved from Andy Webster's header. Rossi-Branco headed the hosts level from Nathan Byrne's centre. "I thought we could have won the game. We went behind to Coventry's only shot in the first half after having numerous chances ourselves. "We always felt as though we would get back into it and we did. "I fancied us to go on and win it but I just felt the excursions from the game on Tuesday had really taken it out of us. "I'm really pleased with the players. I thought the effort was incredible." "I thought at 1-0, in the early part of the second half, we really had real opportunities to extend the lead, but it was a wonderful game of football with two outstanding teams. "We've had a really hard start to the season, I think we've played the best teams so far and we've only lost one of our opening games, the players deserve great credit. "The attitude is absolutely first-class and I really have a good feeling about this group. "Overall, a good point for us, but I'm disappointed that we didn't win the game." Match ends, Swindon Town 1, Coventry City 1. Second Half ends, Swindon Town 1, Coventry City 1. Foul by Andy Williams (Swindon Town). Reda Johnson (Coventry City) wins a free kick on the right wing. Attempt missed. Simeon Jackson (Coventry City) right footed shot from the centre of the box is close, but misses to the right. Attempt missed. Reda Johnson (Coventry City) header from the centre of the box is just a bit too high following a corner. Corner, Coventry City. Conceded by Raphael Rossi Branco. Attempt missed. Massimo Luongo (Swindon Town) left footed shot from outside the box is too high. Attempt saved. John Fleck (Coventry City) left footed shot from outside the box is saved in the centre of the goal. Corner, Coventry City. Conceded by Josh Lelan. Substitution, Coventry City. Danny Swanson replaces Shaun Miller because of an injury. Attempt saved. Simeon Jackson (Coventry City) right footed shot from the right side of the box is saved in the centre of the goal. Attempt saved. Massimo Luongo (Swindon Town) right footed shot from outside the box is saved in the centre of the goal. Attempt missed. Yaser Kasim (Swindon Town) header from the centre of the box is high and wide to the right following a corner. Corner, Swindon Town. Conceded by Reda Johnson. Attempt blocked. Yaser Kasim (Swindon Town) right footed shot from outside the box is blocked. Massimo Luongo (Swindon Town) wins a free kick in the defensive half. Foul by Reda Johnson (Coventry City). Corner, Swindon Town. Conceded by Ryan Haynes. Corner, Swindon Town. Conceded by Aaron Phillips. Corner, Swindon Town. Conceded by Shaun Miller. Corner, Swindon Town. Conceded by Jim O'Brien. Corner, Swindon Town. Conceded by Jordan Willis. Foul by Simeon Jackson (Coventry City). Goal! Swindon Town 1, Coventry City 1. Raphael Rossi Branco (Swindon Town) header from more than 35 yards to the centre of the goal. Assisted by Nathan Byrne with a cross following a corner. Simeon Jackson (Coventry City) wins a free kick in the attacking half. Attempt missed. Jordan Turnbull (Swindon Town) left footed shot from outside the box is high and wide to the left. Jordan Turnbull (Swindon Town) is shown the yellow card. George Barker (Swindon Town) wins a free kick in the defensive half. Foul by Aaron Phillips (Coventry City). Attempt missed. Brad Smith (Swindon Town) left footed shot from outside the box is high and wide to the left following a fast break. Attempt saved. Andy Webster (Coventry City) header from very close range is saved in the bottom right corner. Substitution, Swindon Town. George Barker replaces Connor Waldon.